We’d love your help. Let us know what’s wrong with this preview of Blacksouls by Nicole Castroman. Edward “Teach” Drummond is setting sail to the Caribbean as first mate on the most celebrated merchant ship in the British fleet—until he rebels against his captain. Mutiny is a capital o Nicole Castroman brings the dangerous pirate ports of the Caribbean to life in this vibrant sequel to Blackhearts—the reimagined origin story of history’s most infamous pirate, Blackbeard. To ask other readers questions about Blacksouls, please sign up. Will the majority of the setting be on the ships or the tropics of Nassau? Or balanced between the two? So this is a series now! Is it a duet or will there be more? I'm so happy that Anne and Teach's story continues in BLACKSOULS! The sequel to BLACKHEARTS is a lot more swashbuckling than its predecessor. It shows Anne and Teach leaving a level of high society behind and descending into their roles in this pirate origin story. (I'm excited for people to read BLACKHEARTS, a Blackbeard origin story. This is my imagining of what led him to become one of the most notorious pirates to sail the seas. I feel I need to caution readers...the story takes place in Eng I'm so happy that Anne and Teach's story continues in BLACKSOULS! The sequel to BLACKHEARTS is a lot more swashbuckling than its predecessor. It shows Anne and Teach leaving a level of high society behind and descending into their roles in this pirate origin story. If you're curious about BLACKHEARTS, feel free to check out my Pinterest page. What i love about this series is the pacing and the characters. Anne and Teach were so cool in the first book but I also have fallen in love with so many new characters in this second book. I also loved the setting for this one. Actually reading about sailing the sea and the terminology the pirates use was so interesting! 3.5 stars. Rounding down to 3 star for now. There was nothing really wrong with this book. I think it just didn't totally work for me, at this time. I was kind of bored? Nicole Castroman brings the dangerous pirate ports of the Caribbean to life in this vibrant sequel 3.5 stars. Rounding down to 3 star for now. Brace yourselves for some snark and pirate gifs. What does a girl have to do to find a good pirate novel these days? If Eden's Promise made me question my course, Blacksouls is the one that's taken the wind right out my sails. The disappointment is real. Please note before reading on that this is a very subjective kind of review. Others might not have the same issues. So this is a fictional telling of how Edward Teach became the notorious Blackbeard. I think it's more a romance in disguise of being a history on Blackbeard. Mary Sue and Gary Sue have been separated and after much pining they reconnect. And then Gary and Mary are separated and joined together once more, and once more, and maybe once more? I can't promise that last one happened though, I do admit to losing track. My main complaint about the first book was that a book about pirates should probably take place at sea for at least a couple of pages. This one starts at sea! Hallefraekinglujah! Alright so then the plot gets going. Back to land, that is. Liberties may be taken when writing about historical figures yada yada but man does this Edward Teach character have the morallest moral compass I've ever seen. It's a looooong stretch to think this man might become the Blackbeard. And yeah, Blackbeard was apparently not as evil as we used to think he was, but this character just has no grit. Not everything can/should be young-adultified to this level. It's not just him though. Both Anne and Teach are the goodiest goody two shoes ever, and so are their friends. Everyone else is the most vile and morally corrupt [aristocratic, white, authority]figure ever. No shades of grey. And Anne is so smart she can tell upon first meeting them! And because she's so righteous right, they all deserve to be shot and killed. Mary Sue becomes Trigger Happy Sue. At least there was less girl hate in this one? "I'll find you another ship I promise"
And the one thing this series had going for it is that it wasn't derivative of other pirate books/movies. Sigh. There was just so much potential it makes we want to cry. 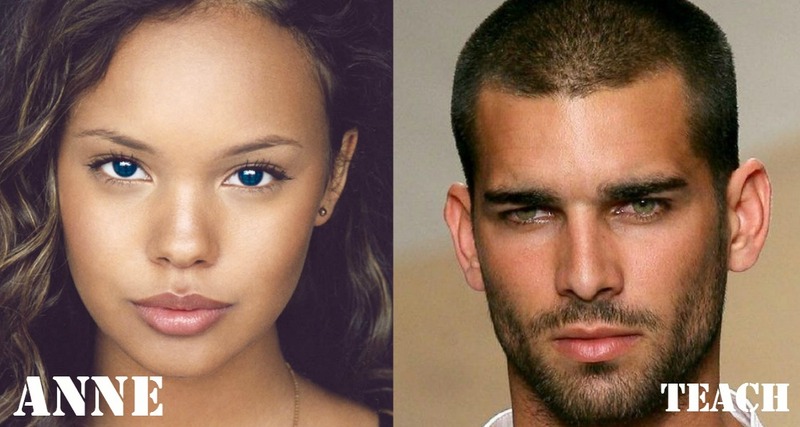 It features a bi-racial main character. It is well researched enough for historical fiction. It aimed to feature a strong female lead (and perhaps she'll get there in future books). I do still commend the author for writing in this niche genre for YA. I think she wrote the book she wanted to write and that, at least, comes through strongly. I think this had all the potential, and for some I'm sure it hasn't disappointed. I think I'd still say go for it and try it for yourself if you have an interest in pirates and/or Blackbeard. The same things may not bother you. And to be fair, not knowing this guy is supposed to be based on Blackbeard might have made me like this more. However, with the lack of compelling characters, lack of any pirates, heavy favouring of telling over showing, and quite frankly the most boring plot I've read all year, this is where me and this series break up. After being separated, Anne is sailing on The Providence to Nassau, hoping that Teach got her message and would come after her. She befriends a pair of siblings-Cara and Coyle-who take her under their wing. Teach is trying to keep his identity a secret on his father's ship, The Deliverance, so that he can go after Anne. But being First Mate leaves him to deal with a cowardly and stupid captain and it isn't long before he realizes that if he doesn't take charge of the ship; they could possibly all die. But after arriving in Nassau both characters find themselves trapped by a powerful man who could very well end Teach's life if he doesn't do what he's told. FINALLY!!!! Though it wasn't as Pirate-y as i'd hoped we did start to see the focus shift to pirates with the setting and the characters. But YES THERE WERE PIRATES IN THIS BOOK!!! It feels like we're building up to that full pirate atmosphere i'm literally craving! We get introduced to new characters- Cara, Coyle, Benjamin, John and many more! I really liked each of them but at the end of the book my heart literally broke at some point!! Where book 1 was much more romance focused this one goes much more into story line and plot. There was quite a lot of action and naval battles *swoons*!!!. The author also did an amazing job at the setting-i felt like i was watching everything play out like a POTC movie in my mind, she really did put in a lot of research! "What Teach wanted most in life was to find Anne and build a quiet life together somewhere, away from the rest of the world. Only then would he truly be happy. Only then wold he truly be free." Even though he's super protective of Anne and always wants her to stay out of harm's way; he never makes her feel caged or entrapped. I think we're slowly working up to the changes that turned him into Blackbeard because so far he's been through A LOT and i guess i can start to see the subtle change. I can't wait to see what finally drives him off the edge COMPLETELY and turns him into Blackbeard because now he's starting to walk towards that edge but he hasn't reached it yet. "He never wanted people to dread him or the sound of his name so much that the only emotion they felt at his death was relief." My poor poor Teach, this is historically ironical (If that's even a thing). Anne really stepped up in this book! She really wants to find a place where she can belong and no one will judge her for her mixed heritage and she thinks she finds that in Nassau but even though most people don't bat an eye at her, some still retain the cruelty of racism and prejudice. Though she came back as strong as ever and is as stubborn as ever! I can't wait to get to the next book for more adventures and hopefully MORE PIRATES!!! Not gonna lie, I've been looking forward to this book for a LONG time. Ever since I read "Blackhearts" over a year ago and fell in love with Nicole Castroman 's writing, I've been dying to read the sequel. You can read my review of Blackhearts here to see exactly how much I loved it and at the very end you'll also see how nervous I was that there wouldn't be a sequel. Thankfully, my worries were put to rest when I heard about "Blacksouls" and all I had to do was WAIT! So, was the wait worth Not gonna lie, I've been looking forward to this book for a LONG time. Ever since I read "Blackhearts" over a year ago and fell in love with Nicole Castroman 's writing, I've been dying to read the sequel. You can read my review of Blackhearts here to see exactly how much I loved it and at the very end you'll also see how nervous I was that there wouldn't be a sequel. 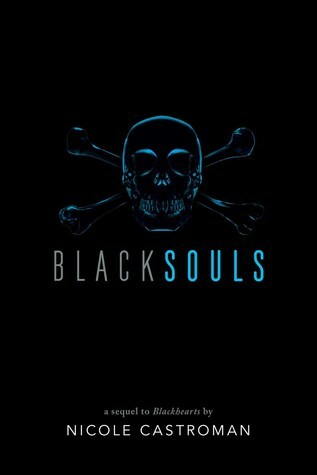 Thankfully, my worries were put to rest when I heard about "Blacksouls" and all I had to do was WAIT! So, was the wait worth it? Could I possibly love "Blacksouls" as much as I loved "Blackhearts"? The answer is, YES! I loved "Blacksouls" as much as "Blackhearts"! In fact, I loved it even more! There was so much I loved about the book, but I think at the end of the day, the reason why I loved it so much was because it evoked such vivid imagery and emotion for me. As I was reading, I could picture each and every scene in my head. The characters were developed so fully, the world built so vividly and the plot progressed so naturally. "Blacksouls" is a book and series that I could totally see on the big screen and now it's all I want out of life. There's more action and more adventure in this book, and it was so fun to take the story of Teach and Anne onto the open seas and to the unpredictable shores of the Caribbean. It's such a different backdrop from book one and that brought some drama and mystery to the story. Nassau is filled with some seriously shady characters and I never quite knew who to trust. Just when I thought I had one character figured out, everything got turned upside down and I was left speechless. I LOVED IT! There's nothing I love more than an epic plot twist, and "Blacksouls" had plenty of them. Quick note, there are a bunch of new characters, but one in particular that I NEED to know more about. She's sarcastic, badass and totally mysterious...and I won't rest until I know everything there is to know about her. So, I don't want to spoil too much of the book but I will say that there were plenty of Teach and Anne swoons to keep me happy! I loved to see them both develop separately but, not gonna lie, I LOVE these two together. Absolutely one of my newest "ships". Especially after seeing what they went through in this book. These two are put through some serious tests and my heart ached for them so much. Which, to me, is the perfect hallmark of a shippy couple. You love them together but you also love the feels you get from the obstacles thrown in their way. Or is that just me? As I mentioned earlier, there is a ton of action and adventure in this book, especially in those last 100 or so pages. I got bookworm whiplash from all the twists and turns and I honestly had NO idea how it would end. There's definitely a cliffhanger in "Blacksouls" but I'm trying to remain clam on not let it destroy me. Oh, who am I kidding, that ending ruined me. I NEED to know what happens next. I will say, the ending is absolutely perfect. That last line brought such an evil smile to my face! "Blacksouls" is an epic sequel that's even better than it's predecessor. Action, Adventure, swoons, pirates and badass ladies...my favorite! After that ending on Blacksouls, I was so eager to get my hands on this book. And my main take away is that there better be another book. I especially loved Anne this time around. She refused to be left behind or wait while the men handled things. She learns things to take care of herself and it just endeared her to me so much. Teach, of course, is lovely and the scenes with them together were adorable. The story is fast paced, the bad guys were especially bad, and the ending was satisfying, I'm After that ending on Blacksouls, I was so eager to get my hands on this book. And my main take away is that there better be another book. The story is fast paced, the bad guys were especially bad, and the ending was satisfying, I'm going to need more. A lot more. And a whoooole lot more of Reva. Loved this follow up to Blackhearts. This one really shows the evolution of the pirate. I could almost taste the ocean and smell the black powder from the pistols. Such excellent descriptive writing! My favorite scene is landing on the island when the characters hope to capture the pirate. My soul needs this book, so the blackness fades away. Only Teach can do that!! When I finished Blackhearts last year, my heart was broken into a million pieces. I cried so much at that ending. I literally went online and looked up everything that I could find on Black Beard. I knew that the year-long wait was going to be brutal, and it was. But when I managed to get a copy of the book in my little ol’ hands, I was one happy book nerd. And I can honestly say, the wait was bad, but it was well worth it. Nicole Castroman did an amazing job in delivering us a great sequel to an already amazing series. 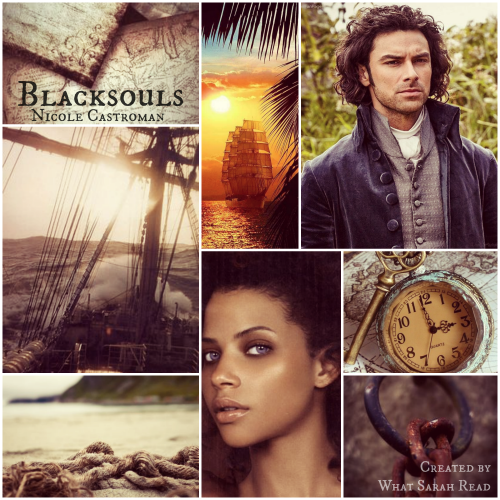 Blacksouls picks up right where Blackhearts left off – Anne leaving on a ship towards Nassau (The Bahamas) and Teach on the Deliverance out looking for her after what his father did to Anne. If you read Blackhearts, you know first hand how devastating that ending was and how we thought that it would be the last time Teach would ever see Anne again. Well, that feeling is sort-lived in the second book. Don’t get me wrong, I am glad that they are reunited, but it just seemed like it was a little anticlimactic since it was such a big deal at the end of Blackhearts. Anywho, that is my one and only “concern” about the book, because the rest of the book, was just nothing short of amazing. I honestly think it’s better than the first book! So much action, so much girl power, I was just flipping through the pages like a crazy person. It honestly made me feel like I was watching it being played out right before my eyes. You know how there are series that suffer from “the second book syndrome?” Well, this surely did not suffer from that ailment! Like I said before, I honestly think it was even better than the first! It’s rare that I enjoy a sequel to a book that I loved even more than the original, but that was certainly the case with Blacksouls. This book is adventurous and swoony but also has some really important messages and themes as well. Blacksouls was an absolute pleasure to read. I fell in love with this series with Blackhearts, but I actually enjoyed this second book even more. Nicole Castroman took everything great that she had going on in Blackhearts and just really took it to the next level. One It’s rare that I enjoy a sequel to a book that I loved even more than the original, but that was certainly the case with Blacksouls. This book is adventurous and swoony but also has some really important messages and themes as well. One thing that I adored about this book, is how it continued the steady progression through Blackbeard’s origin story that Castroman began in Blackhearts. It takes it time, developing his character at just the perfect pace. There hasn’t been just one sudden, devastating event that turned him from merchant’s son to pirate, but a steady progression of plot points that are pushing his character ever closer to the Blackbeard of legend. I also love the fact that these books are not just about Blackbeard (Teach). They are equally about Anne, who is an incredible character in her own right. She has her own story that is so important and is applicable both to the time period the story is told in and today. Her story really focuses on the themes of discrimination, feminism, and the horrors of slavery. The romance between Anne and Teach continues to sizzle. I love the dynamic between the two of them. I adore that Anne is so completely herself with him, and their banter is always so much fun to read. Castroman has done a great job continuing the storyline of the romance into book two, so that it is still just as compelling as it was in book one. This book does have some high-seas adventure, but a lot of the story does still take place on land, this time in Nassau. The way the setting is progressively taking place more and more at sea perfectly reflects the progression of Teach’s character, and I very much enjoyed that. I am conflicted with this one. I could tell the author's writing and plotting greatly matured. Yet for a great part of the novel, I was not as engaged as I'd hoped. Which made me a bit sad, because this one was clearly better than the previous one in so many ways, especially when it came to structure. Plot and character-wise, Blacksouls definitely stood out and made for a much more complex and interesting story than its prequel. It was just very well-constructed, no Full review at Blame Chocolate. Plot and character-wise, Blacksouls definitely stood out and made for a much more complex and interesting story than its prequel. It was just very well-constructed, no question about it. Whereas Blackhearts focused on Teach and Anne's relationship, this one focused on their development as characters and telling a real story. One that was insanely interesting to read once it picked up pace. The romance was mostly non-existent. Though, in my opinion, it was more of a eye-rolling element than anything else and could have definitely taken a different direction. I adored every page of this book! Blacksouls is more than a Blackbeard origin story, it's the story of Anne as well. She has a pirate's heart as much as Teach does, which is why they're perfect for each other. From the lush imagery of the Caribbean to the action and swoony romance, I was enraptured from page 1. I cannot wait to read more about Anne and Teach. An action-packed, heartbreaking, and riveting sequel, BLACKSOULS continues the tale of Teach and Anne as they each set sail for Nassau with the hope of reuniting and establishing a life together. Theirs is a treacherous journey filled with dangerous obstacles, devastating losses, brutal enemies, and unexpected allies. It will test their strength, loyalty, and resilience. And it will awaken their hunger for justice and unleash their thirst for revenge. Anne was anxious about arriving in Nassau wit An action-packed, heartbreaking, and riveting sequel, BLACKSOULS continues the tale of Teach and Anne as they each set sail for Nassau with the hope of reuniting and establishing a life together. Theirs is a treacherous journey filled with dangerous obstacles, devastating losses, brutal enemies, and unexpected allies. It will test their strength, loyalty, and resilience. And it will awaken their hunger for justice and unleash their thirst for revenge. Anne was anxious about arriving in Nassau without knowing whether Teach survived his overseas voyage or whether they’d be able to find one another if he had. But having become close friends with two of her fellow passengers, Cara and Coyle, made her endlessly grateful that she wasn’t arriving in that crowded, unruly port city alone. Nassau was not how she imagined it would be. With its open acceptance of the slave trade, and its cruel and barbaric treatment of its colored inhabitants, she was ill-prepared for its challenges and the emotional toll it would take on her. Even surrounded by friends, and with a safe place to sleep and work, she wasn’t sure she had enough protection or the skills to protect herself. And if she wanted to ensure her survival, she would have to learn to use a weapon, she would have to learn to fight, and she would have to learn to focus her anger so that she could become ruthless. Teach was desperate to get to Nassau so that he could find Anne and they could finally be together without his overbearing father getting in the way. But a threat to his ship’s safety and a captain whose actions would likely get them all killed, meant making decisions that could cause problems for him and the crew if they managed to survive. With corruption abounding in Nassau, his hope of staying under the radar was impossible. He couldn’t even set foot on land before trouble found him. So, he was going to have to find a way to outsmart the Governor if he had any hope of clearing his name, saving his crew, and keeping Anne safe. Nicole Castroman delivered a follow-up that is even more exciting than its predecessor. Battles at sea, the threat of mutiny, a hunt for pirates, the promise of adventure, an attempted murder, all add to this extraordinary, gripping, fascinating tale. It’s a love story. It’s the story of a legend. But it’s also a story about injustice, about human decency, about equality for women. BLACKSOULS is suspenseful. It is heartrending. And emotional. And authentic. It is fast-paced, and imaginative and captivating and amazing. It is a fresh, new, different, and exhilarating addition to this already incredible series with a change in setting, a quickening of pace, an increase in drama, and a number of surprising developments. Hearty har har me mateys! Time to hear about a fellow grand and glorious sea dog . . . If ye haven’t read the first book in this series, blackhearts, then ye might want to skip this post and go read the first book. Worth the read. If ye keep reading this log then ye have been forewarned and continue at yer own peril . . . So I am assuming most of me readers have heard of the fearsome Blackbeard who sailed the waters of the West Indies on the Queen Anne’s Revenge. The first book sets up the “true” Hearty har har me mateys! Time to hear about a fellow grand and glorious sea dog . . . So I am assuming most of me readers have heard of the fearsome Blackbeard who sailed the waters of the West Indies on the Queen Anne’s Revenge. The first book sets up the “true” story of how Anne, a half West Indies / half English daughter of a respected merchant and the young Blackbeard (known at the time as Edward Drummond) meet and fall in love. The second novel continues their story outside of Bristol, England and heads seaward to the Caribbean, mate! While I loved the first book and it’s forays into Blackbeard’s beginnings and how some of the myths surrounding him started, not much of it involved the sea. It was more of the story of how Blackbeard ending up having to go to the Caribbean. This novel begins with Anne on the sea dealing with a dead man and continued to be a non-stop rollickin’ adventure. I devoured this in one sitting and loved every moment. From sea battles, to political intrigue, pirate code, treachery, and swashbucklin’, I found this to be the real pirate tale that I be cravin’. Arrrrr! Both Anne and Blackbeard continue to be fun characters to follow. Feisty, spunky Anne be me favorite in particular. Add in excellent friendships, other pirates, and what life was like in Nassau, and I be hooked. The author continued her entertaining portrayal of what Blackbeard’s life could have been like and how he turned “pirate” so to speak. I mean maybe it happened this way . . . who can say. Me mateys should definitely read this. Side note: This was the author’s second novel. Still an excellent taste in choice of subject matter. Brilliant job. Thank you Simon and Schuster Children’s Publishing! ‘Blacksouls’ is the sequel to Nicole Castroman’s début novel ‘Blackhearts’. It tells of the story of young ‘Black Beard’ the pirate and the women he loves, Anne. I was able to understand what was happening in ‘Blacksouls’ without having read 'Blackhearts' first (although I plan on reading it). If I had known that this series was about ‘Black Beard’ the pirate, I would have begun it sooner. When I was a kid I saw the move ‘Black Beard’s Ghost’ and since then have been fascinated with the pirate. ‘ ‘Blacksouls’ is the sequel to Nicole Castroman’s début novel ‘Blackhearts’. It tells of the story of young ‘Black Beard’ the pirate and the women he loves, Anne. I was able to understand what was happening in ‘Blacksouls’ without having read 'Blackhearts' first (although I plan on reading it). If I had known that this series was about ‘Black Beard’ the pirate, I would have begun it sooner. When I was a kid I saw the move ‘Black Beard’s Ghost’ and since then have been fascinated with the pirate. ‘Blackhearts’ and ‘Blacksouls’ take us back to a time when traveling and shipping goods was incredibly dangerous. I’ve been wanting to read a historical fiction that explains some of the perils of travel by sea. Castroman describes in vivid details the ugliness of life aboard a ship in the eighteenth century. Her descriptions were wonderfully detailed and graphic. I also liked the flow of the switch between 'Teach's' and 'Anne's' POV. I also would have liked to have one edition POV such as 'Easton's' or 'John's'. I loved the characters. I also liked the romance elements of the story which was not at all what I would expect from a novel about pirates. The prose was super easy to read and colorful. I flew through the book. I did find some of the descriptions of ‘Teach’ and ‘Anne’ and ‘Cara’ and ‘Coyle’ a little sanctimonious and the characters’ personalities were a little too black and white, good or evil. I loved ‘Blacksouls’ and I plan to go back and read 'Blackhearts' as well as the third installment in the series. This book was well written, entertaining, educational, and original. I can’t wait to dig into ‘Blackhearts’ the next chance I get. C'est un magnifique livre avec tes sentiments humain ou cœur de l'histoire. Malheureusement la fin nous laisse sur notre faim à savoir ce qui va arriver avec nos personnages. I found the first little bit slow but once the plot became more apparent, it was hard to put down. Definitely the sequel I wanted! You didn't read Blackhearts? Ok, so you should go do that! Because, while I didn't love it as much as this one, you really do need its background to understand the relationships in this book, and the storyline, really. If you don't go read it, you're selling yourself short if you don't! Plus, you might just see some spoilers in this review, and I wouldn't want that for you! This book picks up where Blackhearts left off. Anne has left England and Teach has jumped ship to try and find her. They sai You didn't read Blackhearts? Ok, so you should go do that! Because, while I didn't love it as much as this one, you really do need its background to understand the relationships in this book, and the storyline, really. If you don't go read it, you're selling yourself short if you don't! Plus, you might just see some spoilers in this review, and I wouldn't want that for you! This book picks up where Blackhearts left off. Anne has left England and Teach has jumped ship to try and find her. They sail on different ships but oh so close. I truly loved the in depth look we got through Anne's eyes this time around. She has become such a strong character with a determination that keeps her going no matter the situation into which she is put. She truly takes care of her own needs, though she does worry about others at the same time. She has a wonderful heart. I admire Teach's determination in this book, as well. Nothing will keep him from finding his true love. And he goes after what he wants for sure. He is also unwilling to let Anne come to harm, no matter how much she might want to put herself in harm's way! It was nice to watch their relationship grow even closer in this story. I will say this book had a faster pace than the first. I know the first definitely had more of a world building to it and that's probably why I found it to lag a bit. But for me this one did not have a dull moment. I kept wanting the next scene to come. I kept needing to see what would happen next. And the author was really able to capture the imagery of the Caribbean for me. I felt like I was there, the warm tropical breeze blowing through my own hair! My only fault with this book...hello will there be a third? With the way things ended, though not a total cliffhanger per se, the story is definitely not concluded. I need to know where it goes from here and who comes out the winner on the other end (you can imagine I'll be routing for Anne and Teach!). So good even better than the first one! More pirates! More action! And some more love! There's pirates, a gorgeous romance and a swashbuckling adventure! Blacksouls by Nicole Castroman begins right where we left off in Blackhearts. Anne is sailing to a ruthless island in the Caribbean. And Teach is close behind her, intent on reaching her before anything dire happens. However when they arrive, Teach is charged with mutiny and the only way out is to make a deal with the governor. He must track down a notorious pirate and return him to the island. But all is not what they seem. Blac There's pirates, a gorgeous romance and a swashbuckling adventure! Blacksouls by Nicole Castroman begins right where we left off in Blackhearts. Anne is sailing to a ruthless island in the Caribbean. And Teach is close behind her, intent on reaching her before anything dire happens. However when they arrive, Teach is charged with mutiny and the only way out is to make a deal with the governor. He must track down a notorious pirate and return him to the island. But all is not what they seem. Blacksouls continues Blackbeard’s origin story in this wild, action packed adventure. It’s so good to return to the characters I adored in the first book. Anne, brave and wise, has just as much sass as the previous novel, if not more. Her character will make you laugh out loud at some of her thoughtless outbursts and unbelievable antics. However, whereas Anne seemed to run the show in Blackhearts, Teach's story seems to develop much further in this one. After all, the Blackhearts series is a retelling of Blackbeard's origins. Teach has always been a favorite of mine; he has a heart of gold and the obstacles he had to overcome pushed him to his limits. It was interesting to see what direction he chose. Blacksouls is a superb sequel with a new setting and some new characters, it adds something fresh to the mix, as if starting the story again. Readers get a look at Nassau, the home of Anne's mother, and from the stories told in the previous book, you will be surprised to find—instead of beauty and community—there’s ruthlessness and piracy. That’s right, there's pirates! I adore any book with pirates. And was a bit disappointed to find that Blackhearts didn't offer many pirates for a book promising just those types of scoundrels. To make up for it, Castroman definitely delivers in Blacksouls. We not only get awesome pirates but there's battles on the open seas and ruthless characters! Blacksouls has the perfect ingredients for a book to enjoy during the warmer months; it is a summer blockbuster, action packed with gorgeous imagery that will make you turn the pages faster. The new cast of characters is incredibly diverse and as the story progresses, we get to know almost each and every one of their stories. My new favorite pair had to be the sibling duo, Coyle and Cara. Their easy banter back and forth, paired with their outgoing personalities made them so easy to love. It was interesting how quick Anne made the parallels between her parents and Beth and Alistair. For I didn't really see their relationship for what it was until a little later in the book. Also, it irked me that not only Anne mentioned things I didn't notice until much later, Teach started noticing things that were not initially explained. These claims lacked introduction. How does he know more about this than I do, when I have been with Anne the whole time, and he only just showed up? It seemed that Castroman wanted her characters to be at a certain point without fully leading up to—or developing—such things. I couldn't help but draw parallels between the ending and Blackhearts' ending. Both made me want to continue reading this story. It's not necessarily a cliff hanger but Castroman leaves you with a lead-in that makes you want to have the next book in your hands as soon as possible. Good beginning, meh middle, better end. Anne and Teach are a precious otp, and Anne's new pirate lady friend Reva is 10000000% amazing, and so is her normal lady friend Cara. This book should have had more Reva and Cara. Also Teach's crew of lads are adorable babies and I'm (view spoiler)[ SO SAD ABOUT MATTHEW AND JACK WHY :( (hide spoiler)]. Castroman's characters are something fierce! The dynamics between them all made this book super enjoyable. Just like the first book, I found this on 3.5??? Just like the first book, I found this one predictable. But I didn't mind too much since I adore Anne and Teach and would read an entire book of them just scrubbing a deck. -like the first 5 chapters? THAT is how you open a book. BLACKSOULS is an exciting sequel that finally makes good on its promise of pirates, with plenty of romance and lady power. Perfect for fans of the first book and readers who love their pirates with a side of sass and bloodlust.